It is hard to believe that it has been more than a decade since we first saw The Fellowship of the Ring. It is also hard to believe that since then I have not read the J.R.R. Tolkien books. Let's say it is because I constantly forget to. Yeah? However, despite this time gap and my laziness, Peter Jackson has insisted of producing and directing another trilogy of the Tolkien-verse. While it was only planned to be a two part series, Jackson insisted that The Hobbit (originally about 400 pages) be turned into three parts; An Unexpected Journey, The Desolation of Smaug (2013) and There and Back Again (2014). Part of me (the somewhat rational and filmic side) says that he is stretching the material. The other part (all emotion, guts and chlorophyll) says "No, he proved himself with the LOTR trilogy. Let him eat cake." While it is fair to say that An Unexpected Journey is rich, but overall a decently good journey. Set 60 years before The Lord of the Rings, The Hobbit: An Unexpected Journey chronicles the adventures of Bilbo Baggins (Martin Freeman/Ian Holm). His extremely content and quiet life is shattered by wizard, Gandalf the Grey (Ian McKellan), who offers him the chance to step out of his quaint life to experience adventure and make a difference to Middle Earth. Gandalf invites him on a quest to restore dwarf Thorin Oakenshield (Richard Armitage) to his rightful seat in Erebor, which has been seized by the materialistic dragon; Smaug. With Gandalf and 11 more dwarves, the fourteen of them set out across Middle Earth, discovering shadows of enemies at every turn. There hardest part about reviewing trilogies of this kind is whether you should critique by comparison or if you should critique the movie for what it is. There is going to be a lot of comparison at how LOTR was made and how the Hobbit was made. Understandably, I can see reflections of LOTR in this film. We start with the unlikely journeyman, Bilbo Baggins, trying to prove his worth. The wise old sage joins the quest as well. And there is the deposed king, forced to win back his rightful seat. Now that I have recognised that, I think I can continue. An Unexpected Journey is expectantly slow to begin with. Rightly so, being the beginning of a new trilogy. However, the setup is an hour out of its extremely drawn out three hour run time. With canon, the devil is in the details and Jackson does his best to go through the elements that will set up the trilogy as a whole. For example, we do not get to Smaug at the end of this movie. Martin Freeman is well chosen for the part of young Bilbo Baggins. 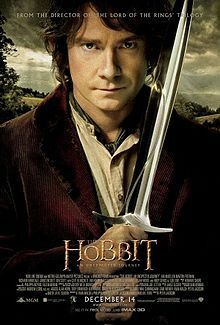 Unlike Elijah Wood's intense and sometime painful to watch and melodramatic portrayal of Frodo, Freeman's quirk and out-of-his-depth nervousness mark a shift in tone in this franchise. Like Orlando Bloom and John Rhys Davies in LOTR, Freeman understands that all great stories are riddled with comedy. He is sure to amuse. Ian McKellan is a welcome sight for sore eyes, and a little more light hearted than previously seen. Richard Armitage grows into Thorin Oakenshild throughout the movie, and it isn't until the end that we see that he is well suited for the role. When seeing this film on the big screen, it is hard to ignore the changes in quality to filming as whole since The Fellowship of the Ring. CGI has improved dramatically. The stone giant fight is a classic example of this, when you compare it to the avalanche scene in The Fellowship. Furthermore, Gollum's CGI return is significantly more unnerving and scary, helped along by faultless Andy Serkis. Martin Freeman and An Unexpected Journey give the Tolkien-verse a much needed brighten up. While LOTR darker than this movie, The Hobbit was after all more a children's tale than a book for those looking for gritty and intense storytelling. The same goes for the cinematic version. Overall, An Unexpected Journey is a lovingly crafted film sure to ensnare most movie goers. And in the end, isn't that what makes a great movie. Unfortunately, I couldn't make it past the 20 minute mark. A real bummer because I loved the animated version as a kid.